A rough night in Montreal last night: Canadiens lost 3-0 to the visiting Minnesota Wild. An optimist might point out that the home team was missing three of its best players in Jonathan Drouin (the club will only say he’s ailing in his upper body) along with Shea Weber and Carey Price (both damaged somewhere lower down). And, hey — woo + hoo — going into last night’s loss, the underperforming Habs had won three in a row. Fans with a darker cast of mind might already be writing off the season. Balancing out their misery, is there an equal and opposite measure of schadenfreude — emanating, maybe, from Boston? Or Halifax? 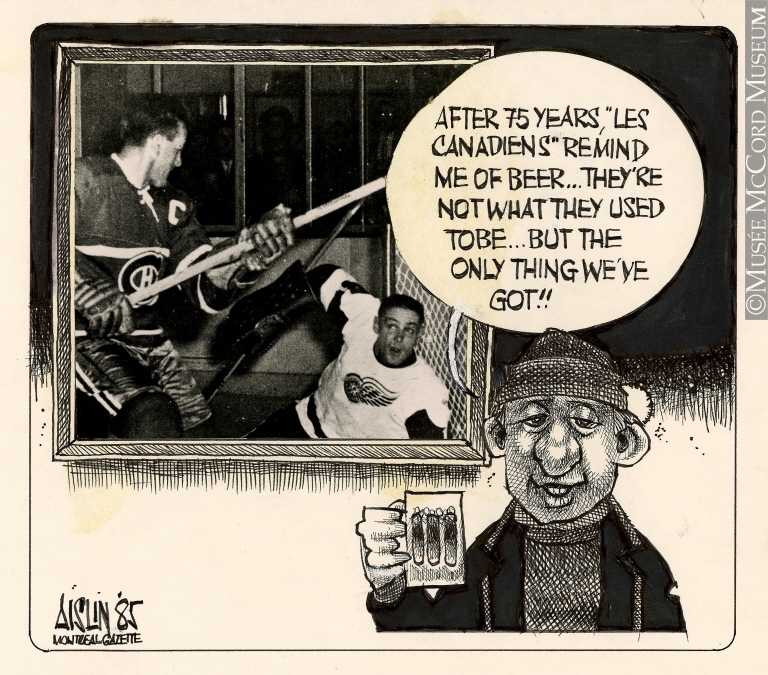 Not to rub it (or anything) in, but it’s in times like these that I recall that the Nova Scotian capital was once, if just briefly, a centre of Canadiens antipathy insofar as Art McDonald lived there. Back in ’88, McDonald self-identified as a 34-year accountant, tax-consultant, and Habs-despiser-from-way-back. Here’s my theory: he wasn’t gloating so much as bleeding from the heart. He loved the Habs and this was his funny self-harming way of showing it. The Calendar was a one-off, with no follow-up editions. With Montreal’s season going the way it’s going, is it time for an update? There’s lots you could say about Bill Durnan. 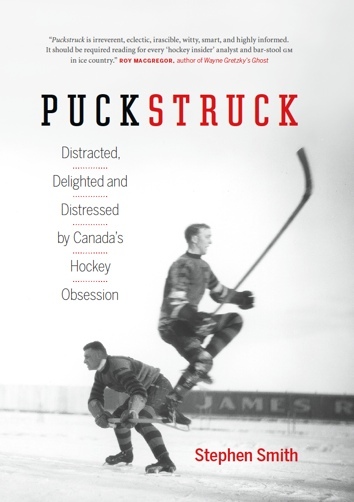 Maurice Richard volunteered that he was one of the nicest guys in the whole world — “He had a smile for everybody and never said a word against anyone” — not to mention that he was said to be the best softball pitcher in Canada during the time he was minding the nets for Montreal in the latter 1940s. He did that exceptionally well, of course, winning Vézina trophies in each of his first four campaigns, as well as two more subsequently: an amazing six in the seven NHL seasons he endured. He won two Stanley Cups with the Canadiens, in 1944 and 1946. In 1964 he ascended to the Hall of Hockey Fame. All of which is to say, it’s no wonder the man had nerves. Not so shocking either that he sought to calm them with a post-game smoke. 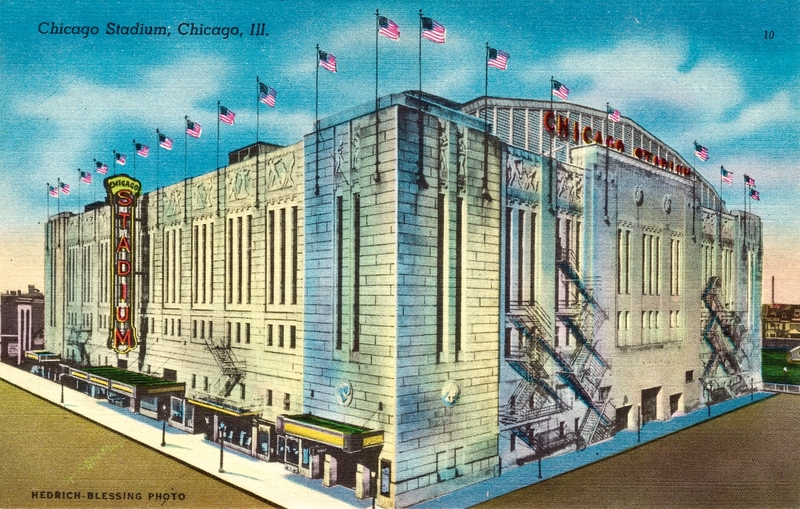 From our modern-day perspective, it is surprising, just a little, to find one of the man’s post-game cigarettes preserved in photographs: that’s something you do sometimes see in hockey scrapbooks and archives, but not so much. The first thing he did upon entering the locker room was to take a cigarette and light it. He removed his pads only after his relaxation was complete. Also worth a note is the C adorning Durnan’s sweater. 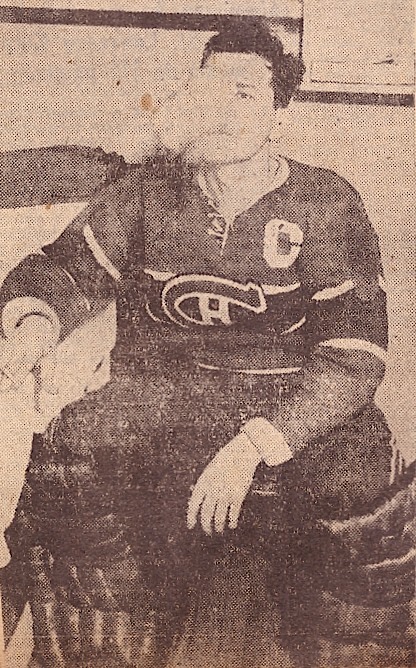 The accepted wisdom is that he didn’t become a Canadiens captain until the 1947-48 season, specifically assuming the role in January of 1948 when the incumbent, Toe Blake, suffered the ankle injury that would prove the end of his playing career. 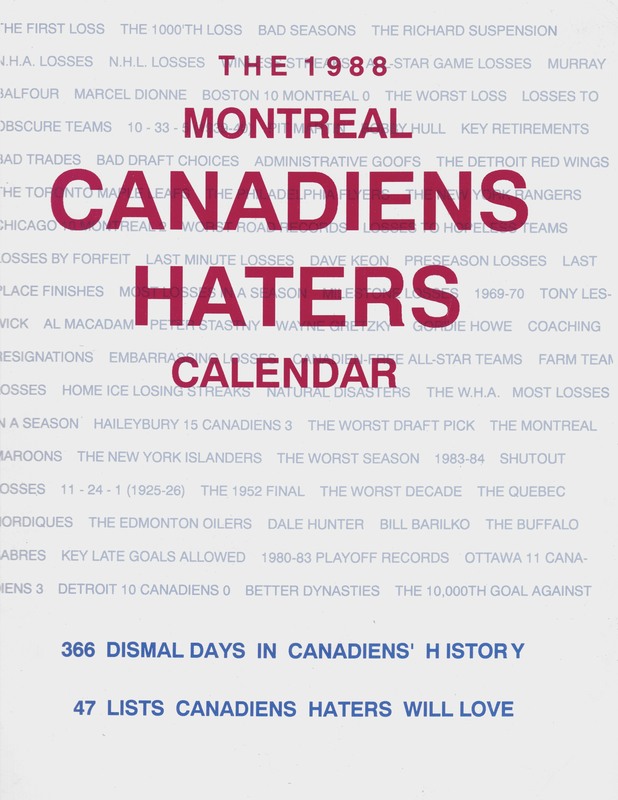 That’s the timing suggested, as well, by modern references, from the Habs’ own historical website at Our History and the Hockey Hall of Fame’s to Wikipedia and Hockeyreference.com. From the photographs here, it’s clear that he was co-captaining the team a season earlier, too. 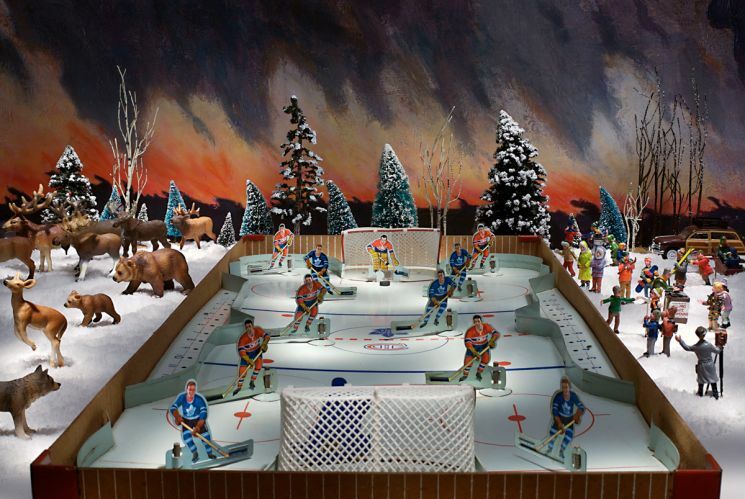 Winnipeg artist Diana Thorneycroft’s 2007 digital photograph “March Storm, Georgian Bay” from her series “Group of Seven Awkward Moments.” “By pairing the tranquility of traditional landscape painting with black humour,” Thorneycroft says, “the work conjures up topical and universally familiar landscapes fraught with anxiety and contradictions.” For more of her sublime northern visions, visit dianathorneycroft.com. was a headline this week at philly.com. Viktor Stalberg looked in the mirror this week and tried to count the stitches. A shot from Anaheim’s Ryan Getzlaf had hit the Chicago winger, Crosbylike, near the mouth, although Stalberg’s jaw didn’t break. “There are still a couple you can’t really see,” he said, regarding the stitches. The doctor said it was 50 to 60, something like that — 20 on the inside and a little bit more on the outside. It doesn’t look great, but it doesn’t feel too bad, to be honest with you. You cut so many nerves, my face is still numb, and you can’t really move it like you want to. I’m sure when the swelling goes down and those nerves heal up it will feel a lot better. Szymon Szemberg from the IIHF had a word, this week, for Ottawa’s 40-year-old captain Daniel Alfredsson: indelible. 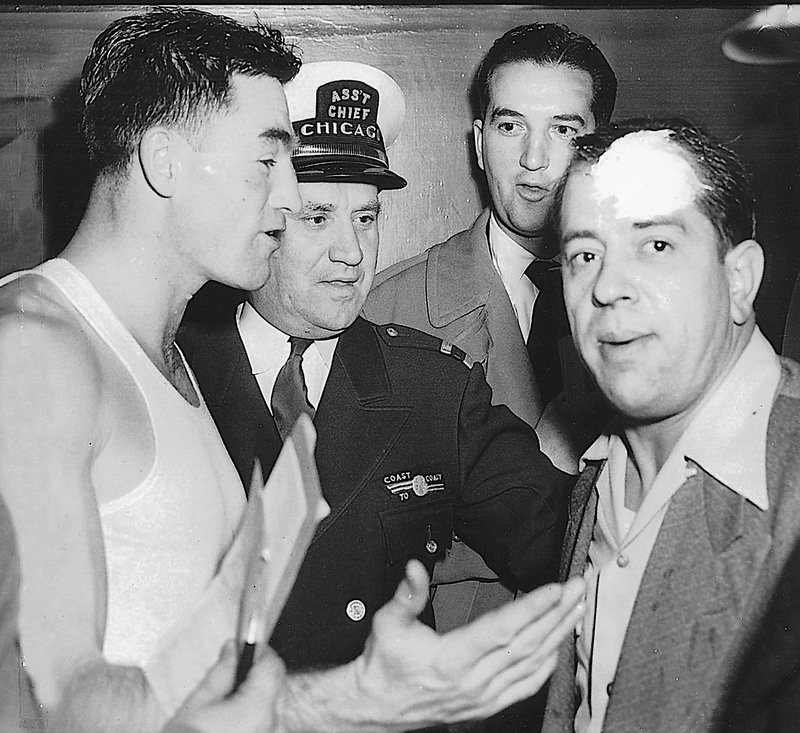 Let me explain: Montreal defenceman Ken Reardon (left) meets Chicago steelworker George Grbich (bandaged) in 1949.